The NC High Peaks Trail Association will celebrate the arrival of Spring with an easy, level stroll along the Laurel River in Madison County on Saturday, April 13. The outing is open to the public and promises a glimpse of early spring wildflowers that line the picturesque old road bed that meanders along this lovely stream. Strollers should gather on the Burnsville Town Square at 9:30 a.m. where they will board a Yancey County van for the roughly hour-long ride to the trailhead. The van ride will cost a donation of $5 per person and pets are not allowed on the vans, so if you want to bring your leashed dog on the hike you must provide your own transportation. Bring water, snacks and hiking poles if you use them. Total hike distance will be up to four miles if the group is willing. The terrain is nearly level, and hikers can turn around at any point they choose and return to the trailhead. Participants should contact Hike Leader Carolyn Raichle at (407) 619-6136 to reserve their seat on the van or if they have any questions about the outing. As always, check the High Peaks Facebook page or website, www.nchighpeaks.org, for last-minute changes due to weather. 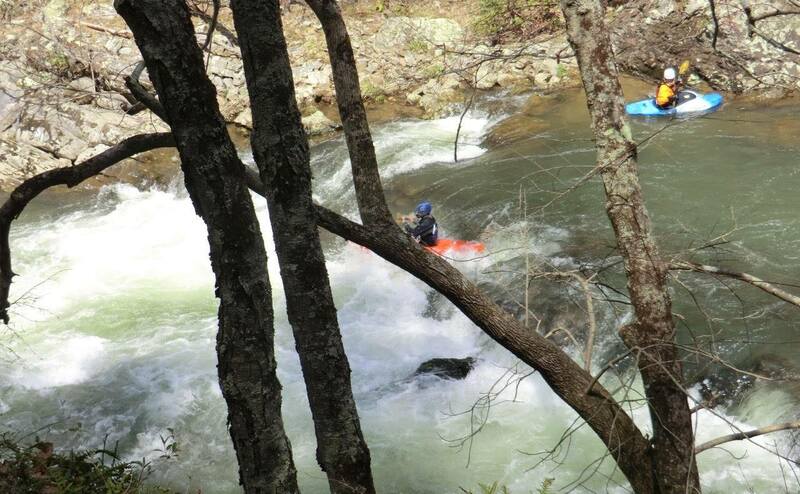 Photo info: Hikers may catch a glimpse of kayakers at play on the High Peaks Stroll along the Laurel River on Saturday, April 13.